Are you taking a pre-employment test? Chances are that it's a personality test. Our Personality Practice Test is the only one that covers the maximum number of assessments of its type in the market. Click now and gain A to Z preparation for tests such as Caliper, which carries tremendous value for all your application processes now and in the future. Access our PAPI preparation personality test and professional profile guide. Aside from resume screening and interviews, personality tests are the most common assessment used in the hiring process. Since these tests are given in the early stages of the hiring process, they screen out a very large percentage of the candidates. Learning about personality tests and preparing for them can help you get one step closer to your dream job. There is the DiSC personality test and the Big Five Personality Tests that can help you. Also, see our professional personality test preparation by company. Need to take the personality test soon? We have a specially tailored preparation for you. Click the "Start Practicing" button below to begin now. Why Do I Need to Prepare for Personality Tests? Although you cannot technically study for a personality test, you can get the results you want by preparing yourself beforehand. When you take a pre-employment personality test, which is mandatory for many senior and management positions, you are placed in front of a computer screen and then flooded with all types of questions that seem to have nothing to do with the job for which you applied. It makes you wonder how these unrelated questions enable assessors to draw conclusions about whether you are fit for the job or not. If you approach the test with resistance, cynicism, anger, or fear, you minimize your chances of success. In fact, the personality test is a much more applicant-friendly tool than many others, such as job interviews. It is well known that the job interview, for example, may be interviewer-biased, while personality tests are fully computerized and your results are 100% in your own hands. Any type of assessment is a stressful experience. Such stress leaves its mark on anybody's performance, and every effort should be made to minimize its impact. Preparing beforehand will decrease your stress levels during the test and allow you to take the test in a way that will best reflect your personality. Maximize your chances of getting the job with JobTestPrep's comprehensive personality preparation: our practice personality tests; detailed study guide, which explains how to answer each question; and "single trait practice," which enables you to understand each trait and recognize and adjust it on the real personality tests and in the interview. There is a total of 219 questions. Both the test format and the scales on our practice test are similar to the most common personality tests on the market. Our personality test study guide will explain in more detail what personality tests are and will help you prepare for any personality test, providing you with tips and information on how to do well in them. It will also teach you how to read instructions and how to deal with the stress of taking a personality test, as well as show you the type of formats in which personality tests are found. We also provide the ideal personality test guide, where you can choose from a number of job types. This will enable you to compare your test results with the ideal job personality to help you get a better understanding of the type of person that specific profession is interested in. In addition, we also offer a unique complementary study guide that is profession-specific, meaning that if you are applying for a certain position, the guide can help you understand what traits are important for that position. We offer guides for the following professions: management, administrative, graduate students, supervision, customer service, sales, technical, IT, law enforcement, and others. With our "Single Trait Practice," you can work on each trait independently at your own pace and practice each trait so you can optimize your answer accordingly on the real test. Practicing for a personality test will help you learn more about yourself and the traits you possess. In addition, preparing will reduce stress ahead of exam day. Remember, when applying for a job, it is best to find out if the organization requires a personality test or if you will encounter personality test interview questions. Preparing for the test or interview in advance can improve your chances of getting the job you want. There are many kinds of personality tests, which use different question formats. Below are some examples of personality questions found on different personality tests. Some of the questions may have styles similar to those of other personality tests. Below are samples of different personality tests that we offer. Start preparing with our free personality practice test. How Do I Pass a Personality Test? When you take a personality test, administrators assume that you have no background information about it and that you will, therefore, give completely honest answers. However, practicing with simulated personality assessments before the actual test will enable you to actively optimize your answers for the position you want. This will undoubtedly have a positive effect on your candidacy. Read the theory guide for important guidelines on how to take the test. Take the full test; it takes around 25 minutes, so make sure you prepare before. Read the personalized report comprised of 50 personality traits. Prepare for your next practice session with our Professional Guide. Re-take the test, focusing on the questions you need to improve. Many employers use questions pulled from personality tests as part of the interview. Coming prepared to an interview will assist you in answering these questions in the interview itself and understand which traits are relevant to this position. In addition, our "Single Trait Practice" will help prepare you for these types of questions. 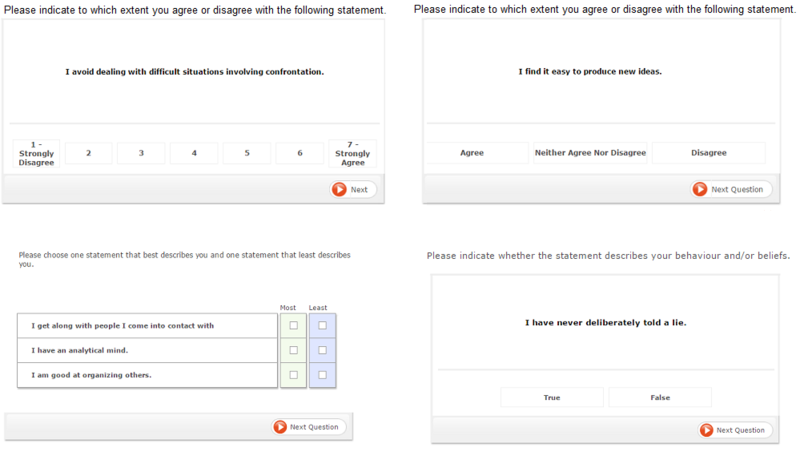 Should I Choose "Strongly Agree/Disagree" or "Agree/Disagree?" There are different kinds of questions found on personality assessment tests. When given a statement with extreme statements such as "always" and "never," you should answer them with less extreme answers such as "agree" and "not strongly agree." However, there are times during a personality test in which you should choose "strongly agree" or "strongly disagree." I rarely worry about how well I'm doing at my job. Being consistent is very important when taking a personality assessment test. On personality tests, you may be asked similar questions that are worded differently. If you answer these similar questions differently, it will be reflected in your results. For instance, it could appear to assessors as if you did not answer both questions completely honestly, which may result in you not getting the job. However, being consistent is not something you need to focus on, as it is not measured. It is a problem only if you significantly contradict yourself; for example, answering "agree" to "I'm never late" and "I have a tendency to be late to some meeting." At times during the test, you may encounter similar statements but not agree or disagree with all of them; in this case, it is fine to answer differently. For example, answering "agree" to both "I prefer working with people rather than working along" and "Sometimes, I need some alone time." Can You Fake Your Answers on a Personality Test? Although you cannot study for a personality test, you can pass by preparing yourself beforehand, developing optimized answers. Get tips on how to take the personality test. Do Personality Tests Reflect the True Me? Personality tests are questionnaires designed to show the various aspects of a person's character. What Are Pre-Employment Personality Tests and Why Are They Used? Personality tests used in the job selection process focus on aspects of your personality that will affect your suitability as an employee. There are some characteristics that are seen as desirable and some that are seen as undesirable. Each characteristic depends on the job to which you are applying. What Is a Personality Profile? A personality profile is a tool used to provide an evaluation of an employee's personal attributes, values, and life skills in an effort to maximize job performance. Personality profile tests questions are designed to find out information about an employee's decision-making skills, communication style, and general attitude towards work. The information from the test is used to match the right employee to the right project or task, especially when working in a group. What Do Personality Tests Say About Me? When applying for a job, a personality test will let the employer know if you can do the job, will do the job, and would fit into the office environment. A personality test can tell how you will handle work-related activities, such as working as part of a team, solving problems, leading others, and coping with stress and pressure. What Personality Test Am I Going to Take? There are many different kinds of personality tests. Each test may use different items to measure your personality type. The most common personality tests use the Five Factor Model to create scales. For more information, see the section about the Big-5 personality tests. Personality tests are the most commonly used assessment test in the employment market. What Is Personality Trait Theory? Trait theory is an idea that suggests individual personalities are composed of broad dispositions. The trait approach to personality test is focused on differences between individuals. The combination and interaction of various traits form a personality that is unique to each individual. Trait theory is focused on identifying and measuring these individual personality characteristics. What Big-5 Tests Are There? Each personality test uses different personality traits. The Big-5 personality test is just one personality trait test. It uses openness, conscientiousness, extraversion, agreeableness, and neuroticism. Some other popular personality inventory tests which are based on personality traits are the NEO and CPI. Other personality inventory tests may not use the Big-five factor, but use more or fewer than five personality traits. For example, the 16PF uses 16 personality traits whereas the Eysenck personality test only uses three personality traits. 16 Personality Factor (16PF) – The 16PF is based on Cattel's 16 personality factor model. It assesses a person's everyday behavior, interests, and opinions. This will help employers evaluate a candidate's abilities. Assess – The Assess personality survey assesses a candidate's competencies for a specific position. It highlights their strengths and weaknesses which helps employers see how they would fit into the company. It has 350 questions measuring 16 personality characteristics/dimensions. Big Five Inventory (BFI) – The BFI is used by employers during the interview process, to see how you answer the questions, giving them a better idea of what kind of employee you will be. It was designed to measure the Big Five dimensions and is a short test, containing only 44 items, that takes about five minutes to complete. Caliper – The Caliper personality test assesses traits related to job performance. It tells employers how well you will fit into the position you applied to. It contains 180 questions. While there is no time limit to the test, candidates spend 2.5-3 hours on the assessment. California Psychological Inventory (CPI) – The CPI assesses a person's personal and work-related characteristics, motivations, and thinking styles. There are long and short versions of the CPI; both were created to help develop leadership abilities by aiding people in gaining a better understanding of themselves and how they interact with others. This assessment helps employers see which position will be the best fit for an employee. cut-e shapes – Cut-e shapes provides a detailed and efficient assessment of a person's competencies. It helps companies identify the best employees, determine which personality traits are important for specific positions, and enable them to identify them quickly and easily. HEXACO – HEXACO is used to determine work-place behavior while assessing six personality dimensions. It follows the five-factor model, with an addition of H - honesty/humility. Hogan HDS – The Hogan Development Survey is a complementary tool to the HPI and measures dark-side personality. It tells employers how well you will handle conflicts and crises and assesses your potential to develop within the company and become an asset. Hogan HPI – The Hogan Personality Inventory assesses bright-side personality, in other words, your day-to-day personality. Employers will use this assessment to determine how well you work with others, how well you will perform as an employee, and what your leadership ambitions are. Inwald – The Inwald personality test is used to assess those going into law enforcement or public safety. It is comprised of 310 true/false questions. International Personality Item Pool (IPIP) – The International Personality Item Pool is a name for a broad pool of personality tools available to use for free. The most common tools are the classical NEO personality inventory and the IPIP-300 which assesses over 30 personality traits. The IPIP-120, which is more compact, is more commonly used by employers. Minnesota Multiphasic Personality Inventory (MMPI) – The MMPI full version is used mainly for clinical purposes. However, is it also used during the police recruitment to make sure that candidates are psychologically stable. NEO Personality Inventory – The NEO personality test uses the big five personality traits. It is used in business and industrial settings to see how employees will function in the workplace. Newcastle Personality Assessor (NPA) – This personality test measures five dimensions, and contains 10 questions. Occupational Personality Questionnaire (OPQ) – The OPQ-32 is used to see how individual's behavioral style will affect his or her performance at work. Personal Style Viewer (PSV20) – The PSV20 test measures work-related behavioral factors that are essential for the effective performance of all types of jobs. Sigma – Sigma personality tests are used in employment settings to see how a person may behave in specific work settings. Sosie – The Sosie personality test is used by companies to match candidates' traits and values with the company/team/position. Talent Q Dimensions – This questionnaire provides your employer with knowledge about you. The results show employers your capable leadership skills. It also shows how you function in a team, your compatibility with the organization's culture and environment, your level of sales skills, and other dimensions. Winslow – The Winslow personality test is used to measure the personality, behavior, and attitudes of employees or applicants. Wonderlic – Wonderlic personality tests are used by employers to get a better understanding of a candidate's personality in order to see if they are a good fit for the position. DiSC® Classic Profile – This profile is used by individuals when preparing for a job interview. DISCUS – DISCUS report looks at key areas such as motivation, communication style, and decision-making to describe a person's work style. Everything DiSC® Profile – Everything DiSC® is the most commonly used DiSC test. It offers various types of reports designed to help you understand yourself and other people, as well. 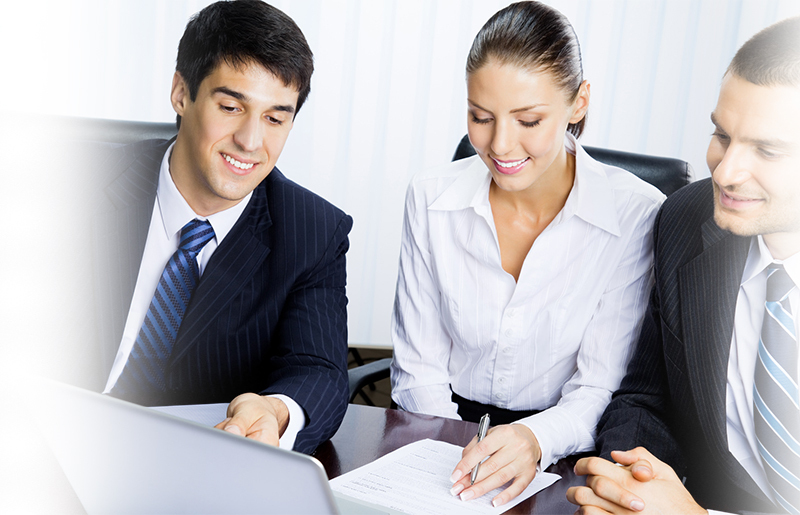 These reports help companies have a better understanding of your working relationships. McQuaig Word Survey – This test measures personality traits and how a person behaves in his or her current job. It is also used to understand what a candidate will bring to the job. Personal DISCernment® Inventory (PDI) – This test helps identify a person's unique behavioral style. The PDI provides a list of strengths and weaknesses that may help or inhibit a person's effectiveness in various situations. Predictive Index – The Predictive Index uses an unusual format in that you will be presented with adjectives and have to mark the ones you most identify with. It is used as a prediction of workplace performance. Thomas International PPA – The purpose of personality tests is to help employers understand whether your own personal profile matches that of the position they are looking to fill. TTI Success Insights – The TTI Success Insights is used to improve teamwork and understand communication styles. Revelian Behavioral Profile – This test aims to help predict job satisfaction and productivity, as well as decrease employee turnover. What Is Personality Types Theory? Types theory is something many personality tests use to describe a person's traits. There are four types which are usually combined to create a four-letter acronym to describe a person. The most known personality test which uses types theory is the MBTI. Eysenck Personality Test (EPI) – The EPI is a personality test that is used as an employment tool to measure job satisfaction. There are two versions of the EPI. A standard form which contains 100 questions that typically takes 30 minutes to complete and a short form contains 57 questions and takes about 15 minutes to complete. Fundamental Interpersonal Relations Orientation – Behavior (FIRO-B) – The FIRO-B is used for employee and management development, team building, and training programs. It focuses on three basic human needs: Inclusion, Control and Affection. Gallup's StrengthsFinder - This exam assesses unique strengths consisting of knowledge, skills, and talents, which can help employers see how you will be in the workplace. Insights Discovery - Insights Discovery is used to help people better understand themselves and others. It also helps companies get the very best from their employees at work. Keirsey Temperament Sorter – This personality test helps companies better understand who you are and how to help you professionally. Kolbe Indexes - This test provides an understanding of the instincts sought by prospective employers. Myers-Briggs Type Indicator (MBTI) - The MBTI helps people gain insights about themselves and how they interact with others and improve how they communicate, learn, and work. Each item on the assessment will be comprised of two different sentences and you will need to choose which sentence best describes you. Personality and Preference Inventory (PAPI) – The PAPI is a popular personality test, while linked to the Big-5 model, the PAPI model assesses 22 scales. It differentiates between Needs and Roles. Therefore, it enables employers to choose employees who have both a fitting personality profile for the job and the right motivation for it. Thomas-Kilmann Instrument (TKI) – This personality test is used to see how an individual deals with conflict situations. Each question consists of two distinct ways of handling conflict scenarios; you will have to choose which scenario most closely reflects your behavior when confronted with a conflict situation. What Is a Job Personality Test? A job personality test is an assessment used by employers to help them choose the most suitable candidate for a position. The test highlights aspects of one’s character and personality. Personality assessments are mostly based on the five-factor model, and they are frequently administered online. Are Career Personality Tests the Same as Job Personality Tests? No. A career personality test tells you what career you would be best fit for. A job personality test is an assessment you take when applying for a job. If you are unsure of what career path you should to take, it would be best to take a career personality test. This test will ask questions which will result in the type of career that best fits your personality type. The career personality test is best to take before searching for a job, as it will give you a better insight of what job best suits you and your personality. Is a Motivation Test the Same as a Personality Test? No, a motivation test is used to see what motivates people. It is sometimes used by employers as part of the preliminary application and selection process. Some employers use this kind of test to improve employee performance within the workplace. A motivation test helps employers identify the factors that increase or decrease enthusiasm and motivation, and it can also help managers build staff motivation by increasing an employee's likeliness to maximize his or her potential. Although it is an important factor, motivation is not only driven by money. In fact, employers are advised to use motivational tests to find ways of increasing their employee’s motivation not through financial means but through other incentives. We are a group of 100+ educators, content experts, developers, and designers who are passionate about creating the right preparation packages for you to succeed. Our PrepPacks™ target specific tests and subjects. The Personality Test PrepPack™ is crafted by JobTestPrep's psychology and recruitment experts and is continuously updated to reflect user feedback and market research.